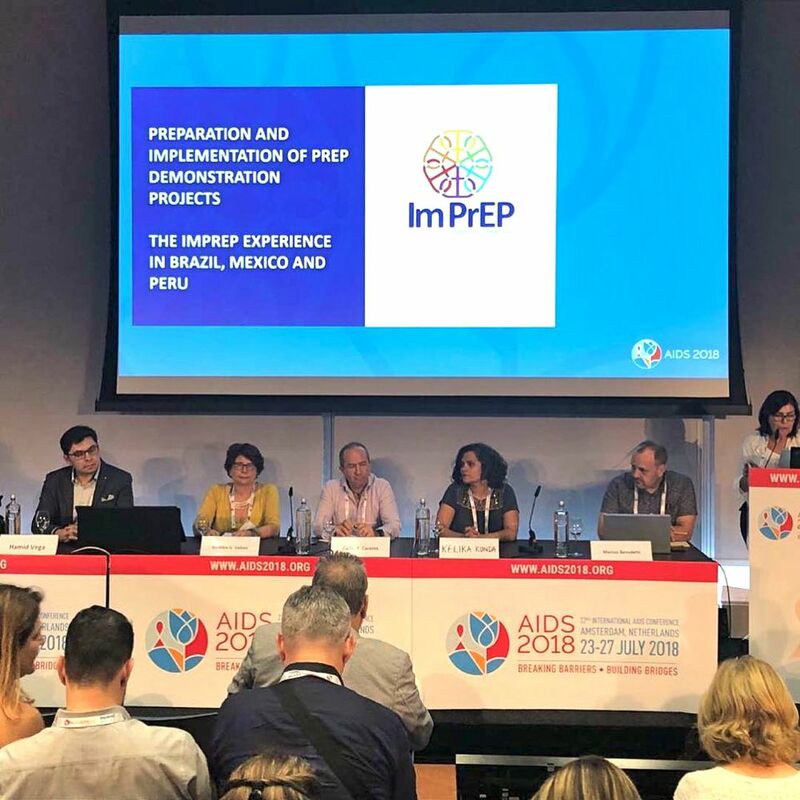 On last July 26, from 02:00 PM to 04:00 PM, during the 22nd International Conference on Aids (Amsterdam), it was carried out the workshop “Preparation and implementation of demonstration projects of PrEP: The experience of ImPrEP in Brazil, Mexico, and Peru”, which counted on the participation of the co-facilitators: Valdiléa G. Veloso, Fundação Oswaldo Cruz, Instituto de Pesquisa Clínica Evandro Chagas, Brazil; Carlos F. Cáceres, Peruvian University Cayetano Heredia, Peru; Hamid Vega-Ramirez, Specialized Clinics Condesa & Condesa-Iztapalapa, Mexico; Brenda Hoagland, Fundação Oswaldo Cruz, Instituto de Pesquisa Clínica Evandro Chagas, Brazil; Cristina Pimenta, Ministry of Health, Brazil; Steven Díaz, Specialized Clinics Condesa & Condesa-Iztapalapa, Mexico, and Marcos Benedetti (ImPrEP). Medium-income countries with concentrated epidemics also face multiple challenges to implement PrEP, including low acceptability between health care providers and program managers due to concerns related to cost-effectiveness, sustainability, need of adhesion, and possible risk compensation, while potential users may have concerns about stigma or secondary effects. The workshop had the presence of 120 participants from several countries, who could listen to the reports about the challenges and difficulties experienced during the process of implementation of PrEP in the three countries. They could also understand – taking into account the form of governance of each country – the context of such implementation in relation to public policies, the combined prevention, in addition to other 5 axles discussed about which ones the technical team of ImPrEP solved the questions that were presented. 1) The involvement of partnerships and construction of networks to make it feasible the implementation of PrEP; 2) Legal aspects of regulation of medicines in the countries for HIV prevention; 3) Preparation of the health care services to offer PrEP; 4) Clinical and laboratory procedure for implementation of PrEP; 5) Involvement and participation of the community groups to generate demand to the public health services to PrEP.